I love dry rava upma. I hate if it is too oily/mushy! I have noticed that the taste of rava upma varies with the type of rava (small/big rava). Note: I usually add 1.5 cups of water for 1 cup of rava to cook rava upma without veggies. I increase the amount of water if I add vegetables. Dry fry rava till it turns slightly brownish in color. Heat oil in a pan do seasoning with mustard, cumin seeds, hing, urad dal, chana dal, ginger and green chillies. Add onion and saute till it turns transparent. Toss in veggies and saute for few minutes. Add water and salt and close the pan. Allow water to boil and ensure that veggies are cooked. Sim the stove and add rava, stirring continuously. Close the pan and allow rava to cook well. Once rava is cooked, remove from the stove top and serve upma with chutney/chips. 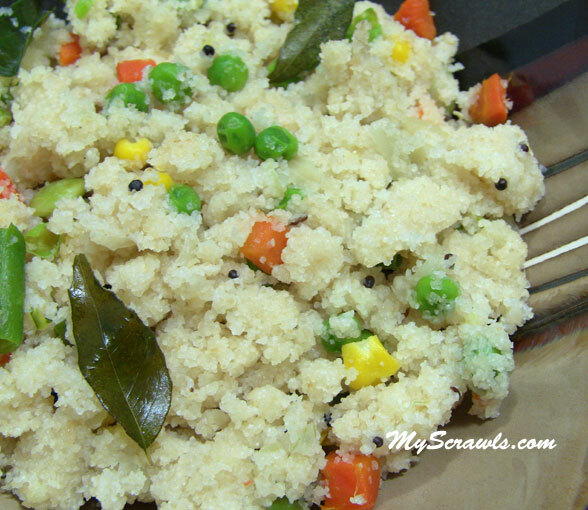 Click here to read about more upma recipes.